It's been forever. Like... forever. Not really? You're right. I won't load you down with the specifics, unless you ask with cookies, but there has been a ton of stuff going on. So, grab a small coffee and check out some new stuff. Hunted by Angels, which I previously self-published, has been picked up by The Wild Rose Press. It has been updated and is now even more steamy. I didn't think it was that steamy in the first place until my mother refused to read past the first twenty pages. She said she just couldn't do it. Knowing that her youngest seed was that grown-up made her vomit in her mouth a little. Everyone else just said that wanted Haines to themselves. Thanks. I had a great time at the 2017 HallowRead. It was a blast! I had a chance to meet some great people, a few of my favorite authors, and a huge bee that was outside the food truck. Seriously. I had to outrun that bad-boy and have my mother get my food for me. It was relentless. 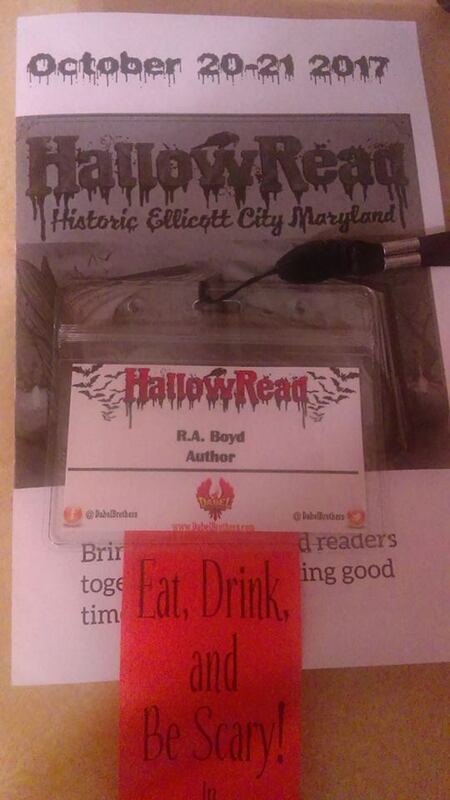 I still had a wonderful time and cannot wait until this years' HallowRead. Come check us out! And... we have a puppy! She's the cutest. I'll show you her pick on the next post. Nyla, my sweet Husky puppy, behaves as if she's a starlet and I'm the paparazzi. So! All is awesome in the land of Me and I just wanted to share.